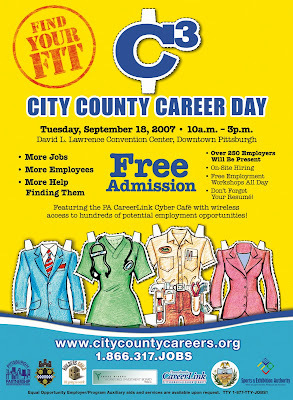 The Burgh Works: City County Career Day Set to Get Underway Tuesday September 18th. City County Career Day Set to Get Underway Tuesday September 18th. In what is being billed as the largest job fair event in Pittsburgh history, City County Career Day, or C3, will be held tomorrow at the David L. Lawrence Convention Center in downtown Pittsburgh. Approximately 250 companies, including over 50 social service organizations, will be on hand offering employment, information and advice to what could be over 4,000 job seekers. Although centered on the building trades due to the large number of Pittsburgh area building projects slated to get underway over the next year, employment opportunities from all categories and skill levels will be available. The event is a partnership between the Three Rivers Workforce Investment Board, PA CareerLink, the City of Pittsburgh, Allegheny County, the Pittsburgh Partnership and the Western Pennsylvania Builders Guild. Hours will be 10AM until 3PM with free admission to all jobseekers. Services that will be offered include tips on resume writing, interviewing skills, finding community resources and even how to get the most out of a job fair. If you plan on attending try to get there early and make it a point to smile and shake hands. This is an opportunity to make a good first impression.